In our shop we sell all sorts of wonderful Indian scarves all Fair Made Trade. India is the land of the scarf, -men’s mufflers for the Himalayan cold, and Beautiful woolen shawls will definitely not be missing in a woman’s wardrobe. We have a selection of very fine woolen shawls . They are so soft and thin yet so wonderfully warm. Only a few of each design - so be quick!!! Woven on a power loom. Hand printed. Dry clean or hand wash with shampoo! We also have a collection of “Gudrie” shawls made of re-cycled silk sari’s. These beautiful reversible silk stoles are made by a women’s collective in Barmer, Rajasthan. The “Gudrie” technique has been used since time immemorial to recycle old sari’s. It was originally used to make bedspreads. Nowadays this technique has been adapted to make these beautiful, and fine shawls. Each Shawl is a unique work of art. 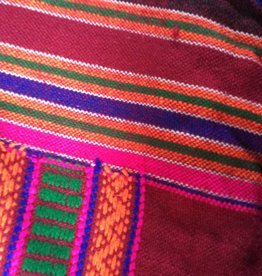 Wrap shawl beautiful handloom, winter wooly warm made in Gujarat India. Measures 110 x 225cm so is multi purpose shawl- single bedspread , warm yoga wrap or for meditation, shawl, warm wrap for chilling on the sofa ecetera. Hand made in India . Wrap shawl beautifully handwoven in winter wolly warm in Gujarat India. Measures 110 x 225cm so can be used voor a multiple of things-- single bedspread , warm yoga wrap, shawl, warm wrap for chilling on the sofa ecetera. Hand made in India . 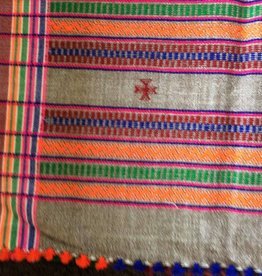 Silk shawl, handwork, measurement is approximately 80 x 220 cm. Made from beautifully recycled silk sari's. Reversable. Colours and prints are combined in unique combinations to create this exclusive shawl.